Here at Lazy Susan, we are fast approaching the end of our high-season and we want to offer you the very best deals possible. So, if you’ve had your eye on one of our beautiful garden benches, been umming and ahing over one of our fabulous table and chair sets or simply just been waiting for the best possible deal to come along, then wait no longer, our Warehouse Clearance Sale has arrived. We’ve heard from our warehouse and the verdict is in: everything must go, so we are launching our garden furniture warehouse clearance sale. 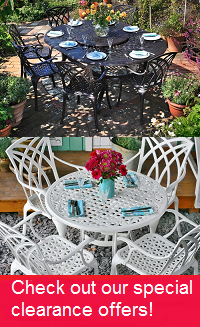 To make room in our catalogue for new and exciting products, we need space in our warehouse to store them, so it’s vital that these selected lines of stunning cast aluminium furniture find a loving home in your garden or house. These great bargains won't be available for long and will definitely not be repeated. So please, have a good look around, find the metal garden furniture set that suits you best and take advantage of our lowest prices. We are always here to help, 7 days a week, so if you have any questions whatsoever, please call the Lazy Susan Team on 01243 71 71 97.